Although the modern market for consumable experiences is obviously broader and more sophisticated than that of the early republic, the idea that businesses could make money selling experiences to an ambitious bourgeoisie in search of cultural and social capital is fundamentally similar. 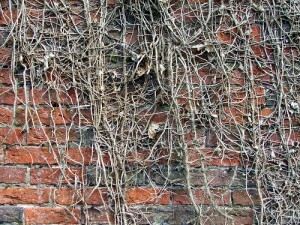 If today’s Ivy League hopefuls are spending their parents’ wealth purchasing meaningful “volunteer” experiences in Central America, then their predecessors sought the scenic delights of Niagara Falls so that they could write home to friends and family about their fashionably sublime experiences contemplating the Falls. And like the admissions prospects who boast of “opportunities … enabled by parental wealth,” members of the early nineteenth century aspiring middle class spent money making themselves in their experiences. 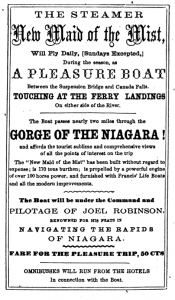 Check out this 1856 ad for the New Maid of the Mist (they were already on a “new” Maid of the Mist in 1856! 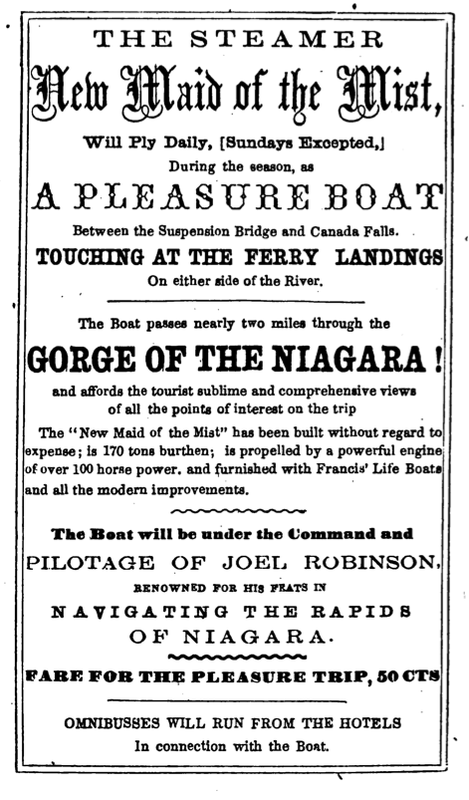 ), a steamboat that carried tourists through the Niagara gorge and “afford[ed] the tourist sublime and comprehensive views of all the points of interest on the trip.” This advertisement worked in 1856 because its audience understood the cultural significance of the sublime, because they had been exposed to a generation of print that taught them that Niagara was the place to go to experience the sublime, and because the steamboat operators offered that experience for sale, in a discrete, prepackaged unit, easily accessed by omnibus from the hotels. Plus ça change.